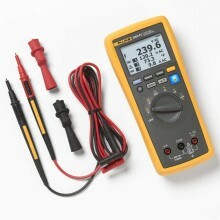 Includes: Fluke 3000 FC True-RMS Wireless Multimeter, TL175 Test Leads, AC175 Alligator Clips and Fluke 3000 Fc User Manual. AC and DC voltage measurements to 1000V. AC and DC current with 0.01 mA resolution. Continuity, resistance, diode test, capacitance and frequency measurements. CAT III 1000 V, Cat IV 600 V; IP54. Introducing Fluke Connect: See it. Save it. Share it. All AC voltage ranges are specified from 1% of range to 100% of range. Crest factor of ≤ 3 at full scale up to 500 V, decreasing linearly to crest factor < 1.5 at 1000 V.
For non sinusoidal waveforms, add ± (2% of reading + 2% of full scale) typical, for crest factor up to 3. Do not exceed 10V Hz. Note In the 9999 μF range for measurements to 1000μF, the measurement accuracy is 1.2% + 2. 400.0 mA accuracy specified up to 600mA overload. mA Fused, 44/100 A, 1000 V FAST Fuse 600 mA overload for 2 minutes maximum, 10 minutes rest minimum. DC Functions The specified accuracy of the measurement function ± 12 counts for changes > 350 ms in duration. AC Functions The specified accuracy of the measurement function ± 40 counts for changes > 900 ms in duration. Ω Fuse Protection From A Inputs 0.44 A (44/100 A, 440 mA), 1000 V FAST Fuse, Fluke specified part only. Battery Type 3 x AA alkaline batteries, NEDA 15A IEC LR6. Battery Life 250 hours maximum. RF Communications 2.4 GHZ ISM Band. Obstructed, concrete wall, or steel electrical enclosure: Up to 3.5 m.
FCCID : FCC: T68-FDMMBLE IC: 6627A-FDMMBLE. Ingress Protection (IP) Rating IP54. 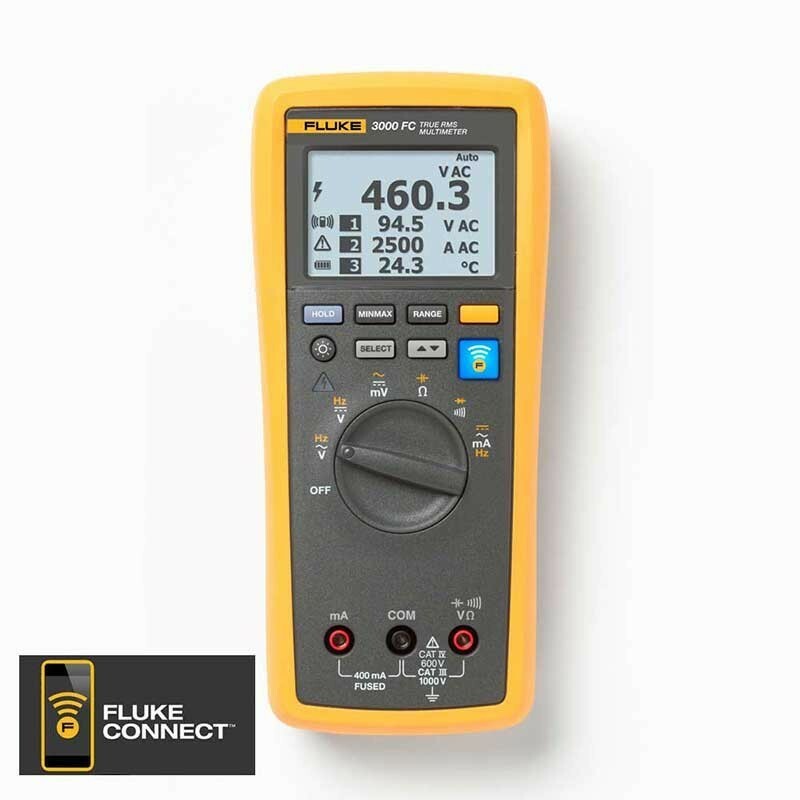 Fluke 3000 FC GMS warranty 3 years. PDF Specifications of the Fluke 3000 FC General maintenance System. COMPONENT PARTS DESCRIPTION PART No. 9 inch hook and loop strap. Hook hanger for non magnetic surfaces.